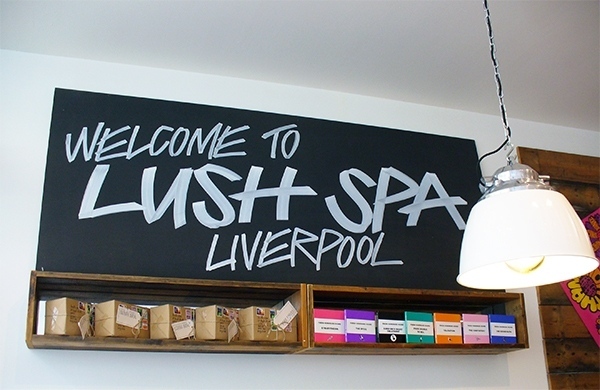 The LUSH shop in Liverpool is keeping a secret from you all, upstairs there is the most beautiful, homely and relaxing oasis, it’s their LUSH SPA and it is beautiful. I was shocked when I walked in as it’s calm atmosphere and country cottage feel is a stark contrast to its busy City Centre location. I wanted to pack my bags & live there. They have managed to make it feel familiar and extremely welcoming. I’ve never had a massage before and was slightly worried that a 75-minute treatment would be a little too long & I had no idea what to expect, but I need not have worried at all. I was greeted by an ice cold fruit infused glass of water and my beautiful therapist talked me through The Hard Days Night Treatment and reassured me it would be relaxing and assured me I wouldn’t be uncomfortable during the stretches. I thought I would be the most inflexible person ever but I was surprised to find that wasn’t the case. A Beatles inspired spa treatment that will release stress from your body, allowing you to let go and let it be. A firm massage with gentle passive stretches designed to relax your muscles and restore energy to your body. 75mins £85. From start to finish everything is done to perfection and utterly relaxing. Once in the beautiful candlelit treatment room, you’re given time to change into a pair of oversized striped cotton pyjamas that have been wrapped around a hot water bottle to keep the snuggly and warm. This is heaven & I’m tempted to start doing this at home. So relaxing, I was almost asleep after a few minutes of lying down wearing them. When you’re all done changing and are ready for your therapist they leave an old school bell for you to ring, made me smile ringing the bell. The Hard Days Night Treatment as the name suggests is inspired by the Beatles and for 75 minutes they are your soundtrack. The music has been cleverly reworked by Simon Emmerson and Simon Richmond specifically for this treatment. I found the familiar songs helped me to relax and the music became soothing. I was sceptical at first but it really works well. Then begins 75 minutes of complete relaxation which lets your mind wander and eventually empty of the stresses of everyday life. Your whole body is treated to a deep massage from head to toe, the massage is very gentl, to begin with and it just eases your body into relaxation and allows you to float away. Then my therapist stretched my arms and shoulders to release my tension followed by my legs and hips. This felt like my back released so much tension & there were a few clicks and I have to say that felt amazing. At no point was it uncomfortable or too much, it was all slow and gentle building up each time to stretching a little further and applying slightly more pressure. Each and every muscle is massaged front and back and head to toe. I thought the hand massage to the accompanying I Want To Hold Your Hand Beatles track was a great touch. It is a well thought out treatment. A nice touch to the treatment was the use of ribbons on your ankles and wrists to lift and gently rotate your arms and legs to make it feel like your weightless and flying, It is a lovely sensation. It’s hard to describe to you every step of my treatment because I was so relaxed and it felt like the 75 minutes just flew by, also each treatment follows the same steps but it is very specific to your needs/flexibility. I thoroughly enjoyed opening my eyes at the end to a large Golden Egg with the words ‘Let It Be’ projected on the ceiling. You are told to stay laying down relaxing when your therapist leaves the room for a little extra ME time & only to get up when you hear the Cockerel. You’re given as long as you need to get ready & have access to a whole array of LUSH goodies to freshen up. Once ready you’re greeted with a lovely Cup of Tea & Jammie Dodger Biscuits, I’m Vegan so I was kindly given fresh fruit. I sat at the large Country Kitchen table very relaxed and enjoyed my afternoon tea. One final parting treat, as part of the treatment you’re given a Golden Slumber bath bomb to take away with you and enjoy at your leisure. I used mine that very night, it was the perfect end to a relaxing day. It really is a special treat from the moment you walk into the second you leave. Every staff member was friendly and chatty, at no point was I hurried and I could have sat drinking my tea all afternoon. It was very welcoming and I have already promised to take my mum next time. LUSH currently have 6 Spas, so if I was you I would find out where your nearest one is & book in for a treatment. They offer a great range of treatments from Facials, Chocolate Body Scrub & Rose Massage to Deep Tissue Massage. There certainly is something for everyone. The invitation to have a treatment couldn’t have come at a better time, I had just moved house (stressful) and as many of you know my dad is a recovering Stroke Survivor and that has really been taking its toll on me. So it was absolutely amazing to be pampered for the afternoon. So thank you so very much Liverpool LUSH SPA, I had a lovely time and you now have a customer for life. This treatment was free of charge, however, the review is 100% my own.